What percentage of the acceleration at Earth's surface is the acceleration due to gravity at the position of a satellite located 300 km above Earth? This is College Physics Answers with Shaun Dychko. We begin by collecting some data we'll need for this question. The radius of the earth is 6.38 times ten to the six meters and then the distance above the earth we'll call that delta r, is 300 kilometers and we'll convert that into meters by multiplying by 1000 meters per kilometer and that's three times ten to the five meters. 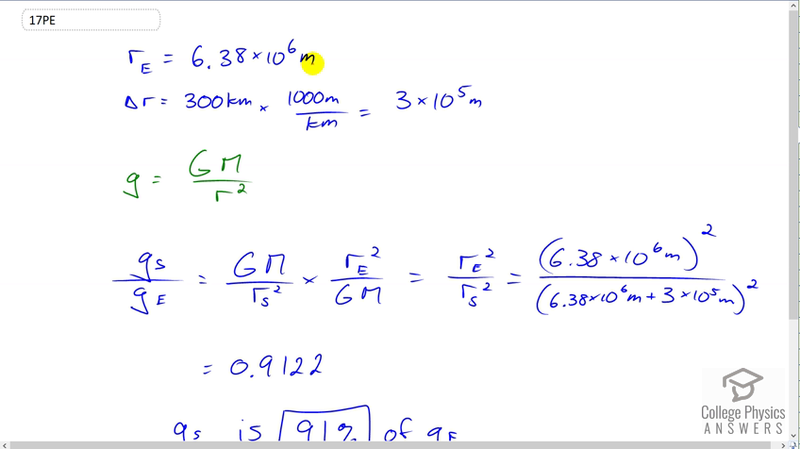 The acceleration due to gravity at any particular distance from the center of the body is the gravitational constant multiplied by the mass, divided by r squared. We're told to find out what is the percent of the acceleration due to gravity at the position of the satellite, what percentage that is of the acceleration due to gravity on the surface of the earth. So we'll put a subscript s for satellite position, and a subscript capital e for surface of the earth. Now, the acceleration due to gravity at the satellite position is g times mass of the earth divided by the distance from the center of the earth to the satellite squared. Then we're going to divide that by the same equation with data for the surface of the earth. But instead of dividing by this, let's multiply by its reciprocal because then that'll avoid having a fraction over a fraction which is kind of confusing. So keep everything in line like this by instead of dividing we're going to multiply by the reciprocal. So we're multiplying by the radius of the earth squared, so that's the distance from the center of the earth to its surface, divided by the same gravitational constant and also divided by the same mass, mass of the earth. So these things cancel leaving us with r E squared over r s squared. So that's 6.38 times ten to the six meters, radius of the earth, squared divided by the radius of the earth plus the distance above the surface of the earth, and square that sum. We get 0.9122 and so that means the acceleration due to gravity at the position of the satellite is 91% of the acceleration due to gravity at the surface of the earth.